Acupuncture is part of a broad system of traditional Chinese medicine which includes: herbal medicine, Tui Na (Chinese Massage), Meditation, Chinese Dietary Therapy and Tai Chi & Qi Gong. Acupuncture needles are solid, extremely thin and pre-sterilized. During the treatment, needles are inserted under the skin. Most patients report little or no discomfort. Acupuncture is a health promoting preventative therapy that benefits body, mind, and spirit, and is also helpful for complaints for which there is not an easily determined medical cause. People who have chronic symptoms or illnesses, a lifestyle that places great demands on vitality and well-being, and are committed to improving quality of life can benefit from acupuncture. Acupuncture can treat neuromusculoskeletal disorders, addictions, respiratory disorders, gastrointestinal conditions, gynecological problems, urogenital disorders and emotional disorders. Acupuncture is safe. Unlike drugs and other therapies, side effects of Acupuncture are extremely uncommon. For example, a woman may come to an acupuncture clinic primarily for the treatment of chronic sinus pain. The practitioner provides a treatment that attends not only to the sinus pain but also to the patient’s internal imbalances and disharmonies discovered during treatment. After several treatments, she may notice that the sinus pain has been completely relieved in addition to an improved sleep pattern and disappearing pre-menopausal symptoms such as hot flashes. This scenario is not uncommon. 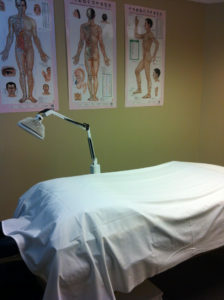 In addition to needles, a number of other tools and techniques are used to offer appropriate therapy: Moxibustion, bleeding, electro stimulation, and herbal therapy. Watch the videos below to learn more about acupuncture and what you can for acupuncture. 5 visits at $82- $410 total you save $15. 10 visits at $78 – $780 total you save$70.